Google Now is arguably the single biggest competitor to Apple’s Siri personal assistant. The voice recognition and assistant keeps track of everything from the weather, to the football scores, all from the convenience of your Android device. You may not have to rely on reaching for your mobile device anymore since the latest build of Google’s experimental Google Canary browser introduces the notifications to the desktop environment. Google Now cards are available in the latestChrome Canarybuild for Windows and Mac (34.0.1788). You only need to go tochrome://flags/#enable-google-now, then switch from “Default” to “Enabled” and click “Relaunch Now” at the bottom of the page to restart the browser. 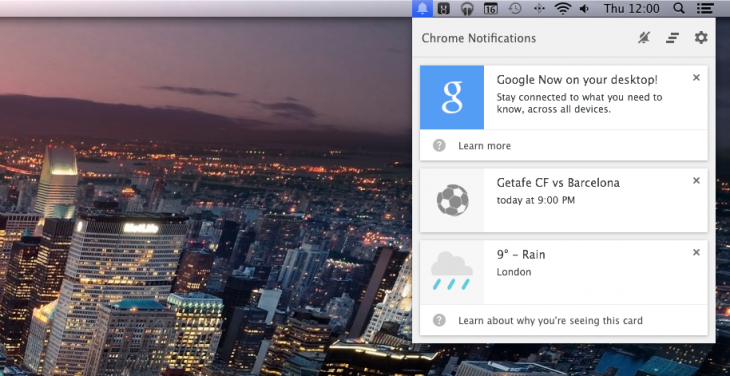 Simply toggling a flag to enable Google Now on the desktop will allow alerts to be sent to the menu bar on a Mac, and the taskbar on Windows. However, Google has warned users that it’s not really a seamless experience, not in comparison to Android and Chrome OS anyway. If you’re signed into Chrome you’ll see a Google Now notification and then a list of cards – just look for the bell icon. As the feature is still experimental, expect some hiccups here and there, and also expect it to be a while before it’ll hit the official Google Chrome browser, but it is another step in the right direction towards an agnostic Google with their software. Whilst other personal assistants are limited to the platform for which they are designed, Google Now can be enjoyed regardless of which software environment and platform you are using.